AM Aerials Installations' expert engineers are qualified by Sky to provide excellent service in Sky TV satellite and multiroom installations. 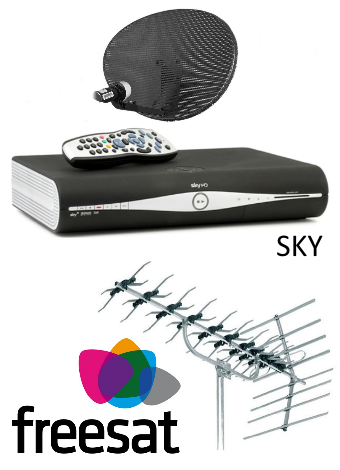 We offer specialist Sky TV installation solutions, even if you've been previously denied by other companies. Our qualified engineers cover the South-East and London and are experienced in Sky TV installations considered to be 'difficult'. Each have special heights training and hold working from heights certificates, ensuring successful job completion. We have always found our clients to be extremely satisfied with our results. Sky TV offers hundreds of satellite channels and programmes, from art and history to sports and entertainment, all broadcast in fantastic digital quality. There are a variety of subscription packages available, easily customised to suit your needs. Sky TV also lets you take part in TV programmes, make purchases, play games, and send text messages and emails with their interactive TV service. Similar to Freeview+ and Freesat+, Sky+ will let you pause, rewind and fast forward live TV shows. Using the Sky+ mobile app, you can even record your favourite TV shows while you’re out, ensuring you never miss a programme again. Sky+ also lets you record an entire series at the press of a button. Sky HD is the ultimate viewing experience, providing almost life-like viewing and Sky+ recording facilities. With Sky HD you’ll enjoy four times greater picture clarity, sharper, more vibrant colour and images. Many digital high definition programmes also have surround sound. Bring the cinema to your living room with Sky 3D, a fantastic service which allows you to experience television and movies as never before with the only dedicated 3D channel in the UK. You can enjoy a range of exciting sports and eye-popping entertainment or even rent the latest 3D movies with Sky’s dedicated 3D channel.